FOR REBEL GIRLS WITH BIG DREAMS! Perfect for fans of the chart-smashing Fantastically Great Women Who Changed the World and tapping into the huge demand for stories featuring strong female characters, this is a pirate story like no other. Peg’s determination, ambition and courage to be herself will inspire a whole new generation of rebel girls. 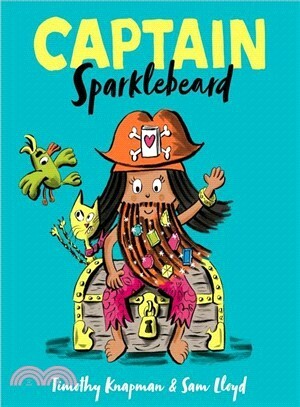 Smashing gender stereotypes and with an inclusive cast of characters, this is the must-have book to empower young children to have the courage to be themselves. Tim Knapman writes plays, musicals, songs and children’s books and has been published by Simon & Schuster, Puffin, Macmillan, Scholastic, Hachette, Egmont UK and many more. His previous books include the bestselling Dinosaurs in the Supermarket, Dinosaurs Don’t Have Bedtimes and Superhero Dad. His books have been translated into 20 languages and several have been read on CBeebies bedtime stories. Tim has done more than 100 events and readings in schools, colleges, bookshops, fairs, libraries and festivals. He lives in Sussex and his hobbies include swashbuckling. Sam Lloyd is the illustrator behind the bestselling Mr Pusskins series which won the Roald Dahl Funny Prize, the Booktrust Pre-School Award and was shortlisted for the V&A Illustration Award. Her novelty books include the Richard and Judy prize-winning Calm Down, Boris and Hello Dudley. Sam’s books have been translated into over 15 languages. Sam lives in Brighton with her son Ozzy and their ginormous ginger cat. Timothy Knapman writes plays, musicals, songs, and children’s books including A Very Pirate Christmas. Sam Lloyd is the illustrator of Farty Fred and Grumpy Gertie.